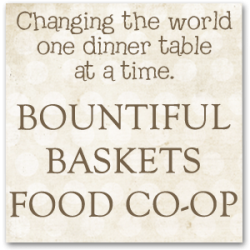 Did you pick up your basket this morning and after examining the contents ask yourself, “What in the world is that and what am I supposed to do with it?” Well, I’m here to give you a tip or two on what to do with that item that you may not be familiar with. This week the surpise item is Champagne Grapes. Yes, those tiny beads of delightful taste are not grapes that picked too early nor did they shrink. They are actually “born that way”. 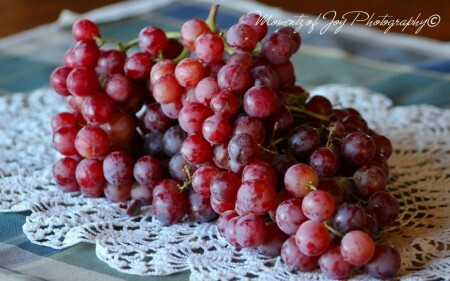 Champagne grapes are completely seedless and are a heavenly sweet delight. They are most commonly seen as garnish on fancy schmancy meat and poultry dishes as well as in cheese displays. If you’re a fan of dehydrating fruit you can dry Champagne grapes and you will find yourself with the most delicious currants you’ve ever tasted. Of course you can just pop them in your mouth and eat them as is but if you’re feeling a little adventurous and want to impress your family try this quick and easy recipe that I’ve made for my crew. Preheat oven to 400*. Combine herbs and set aside. Rinse tenderloin and remove silverskin. Combine spices and rub tenderloin with herb blend. Heat 1tbs. extra virgin olive oil or grapeseed oil over medium high heat in an ovenproof sauté pan. Once the pan is hot sear all sides of the tenderloin then place in hot oven. Cook tenderloin until the internal temperature reaches 145*(**see note below). Remove tenderloin from the oven. Remove tenderloin from the pan, set on a plate to rest and cover completely with aluminum foil (Resting allows the juices to settle and the meat will stay moist and tender. Covering meat with foil while it is resting also allows it to continue to cook internally without drying out in the oven). Slice tenderloin at a diagonal, plate pieces and spoon grape reduction sauce over the pieces. You can serve with any starch and/or veggies of your choice. For many years the recommended culinary industry standard for the internal temp. of tenderloin has been 160° degrees. In recent years that has changed for lean cuts to 145°. Hello! I want to dehydrate the champagne grapes. At what temperature should I put the dehydrator and how long should I dehydrate them? I have tried one batch but they seem too hard, and I am tempted to throw that batch away. The problem is they are really sticky and there always seems to be about 10 or so on each tray that are never done when the others are. They were on there 24 hours at 135 degrees the first time. Any advice would be much appreciated! Thanks! I just ran my hand gently down the bunch of grapes and they fell away from the stem. The whole box took 5 minutes. I made mine into raw chia jelly and served it as topping for fresh sliced peaches for a nice chilled desert. Really they will cook away in a recipe. They are fine to eat. Just get what you can. There is no need to stress. Pop a few in your mouth and try them. They are very tender and we (the husband and I) found them to be lemony. Of course take off all of the large ones. I did make the grape cake with the tiny stems. They seems to dissappear after baking. Really. Nan—Do you have any tips for destemming these things? I’m just coming off of an hour of destemming these little rascals and I have no desire to make the cake, I set out to make in the first place! These are delicious, but any tips would be greatly appreciated. Thanks! This looks great. We made shrimp and champagne grape salad and champagne grape cake.